After the frustration with my server, here goes: Fortunately for gallery owners, tastes differ, so don’t think that the artists i discuss are the only ones that i visited. These are only the ones that i found personally interesting. 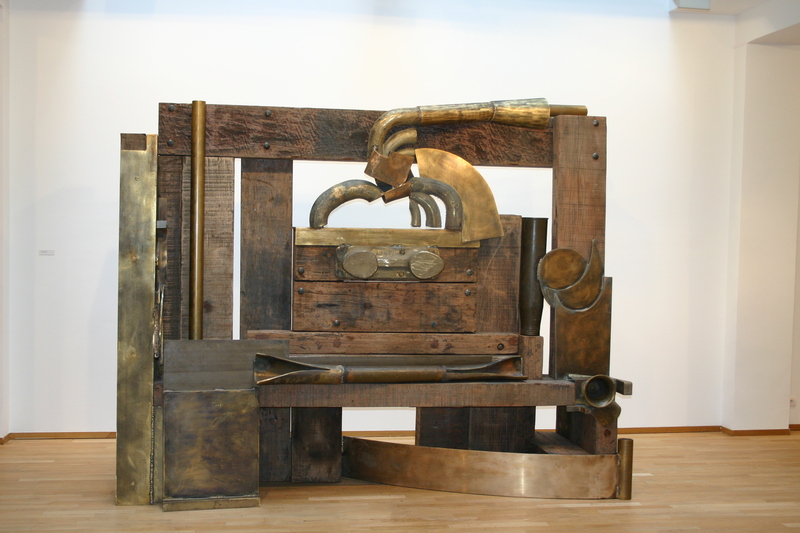 Galerie Daniel Templon showed works by ANTHONY CARO (sir). One of the best known British sculptors. All his works are large, freestanding, welded and bolted pieces of steel or iron. The gallerist definitely made sure that his floors could take the weight of these pieces, because they are huge and HEAVY. Caro was born in 1924, so he is 86 at the moment. he definitely stood/sat in the middle of his studio/workshop and directed his army of helpers to make these pieces. He says of his works: “doing abstract sculpture at the moment is not an obstacle, but it liberates me to explore unlimited possibilities”. The works on this exhibition were constructed with found objects – heavy machinery, unrecognizable pieces of metal, and railway sleepers. 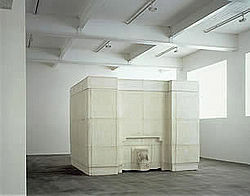 Lize or miki and i saw the now famous “SENSATIONS” exhibition of the collection of Saatchi and Saatchi in 1997, where Whiteread exhibited her “Ghost” piece (see photo of white plaster). Whiteread is the first woman to win the British Turner Prize. Her work is almost always architectural in nature, but what makes it special, is that she only works with negative spaces – that is the insides of objects. 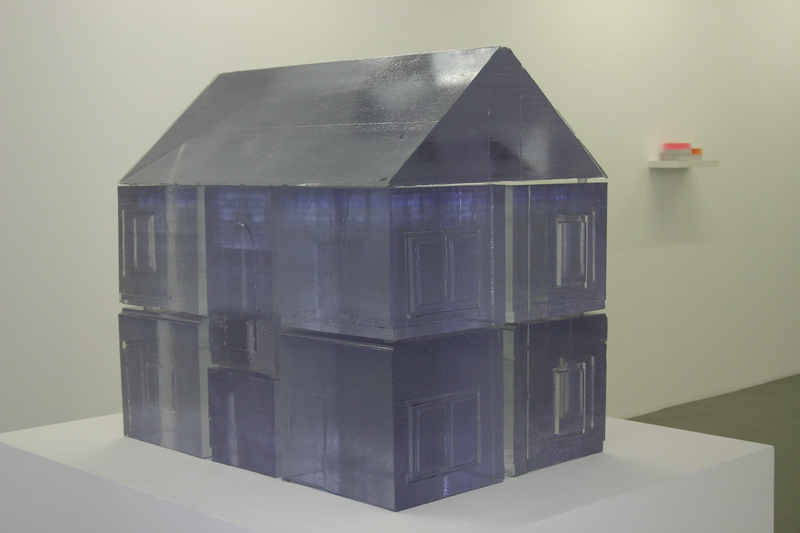 She makes molds of these spaces and then casts them in solid materials such as plaster or resin. Her work is a good example of where a single idea defines an artist’s life work. The works on exhibition are small in scale, casts of tubes, a child’s dollhouse, medicine packaging. These works are entirely different from the previous two serious British artists. Whimsical and with a sense of humor. 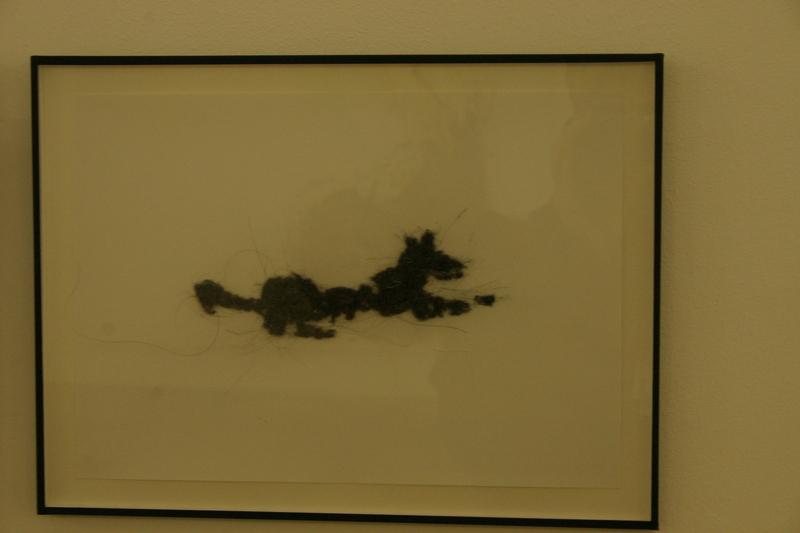 In his smaller peices Sabatte works with human and dog hairs, dust, floor wipings. Only on close-up can one see how he “draws” with the hairs to form the lines of his “drawing”. Sounds corny, but looks good.